"Out of a hundred million men, I had to break the mirror." 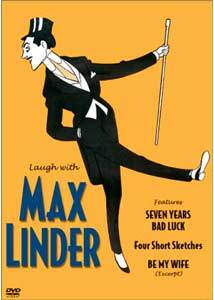 French comedian Max Linder is practically forgotten today, but the diminuitive (5'2") and dapper mustachioed comic made a highly successful series of one-reelers in the years before World War I; before Chaplin shot his first Keystone comedy, Linder already had well over 150 starring pictures to his credit. This collection of some of Linder's best makes it clear why he was admired by Chaplin himself, not to mention beloved by millions of viewers. The principal feature is Seven Years Bad Luck (1921), one of the few American features that Linder did for United Artists. Max accidentally breaks his full-length mirror and is convinced that he faces seven years' bad luck. Whenever something seems likely to create a risk, he takes another approach, but in the process causes more trouble for himself than he would have otherwise. He loses his fiancée Betty (Alta Allen) to a treacherous best friend (F.B. Crayne), engages in trickery to get onto a train and assumes a wide variety of costumes to avoid getting thrown off, and winds up in jail scratching a flea-bitten jail bird (Cap Anderson) before he gets a chance to set things right. Linder's slapstick style stretches out surprisingly well to a (barely) feature-length picture. He is willing to milk a situation for all its worth and then changes locales to set up the next set of gags. The physicality of his earlier shorts is still in view here, despite his ill health as a result of being gassed in World War I. Particularly notable is the early sequence where his valet (who originally broke the mirror himself) set up the cook to mirror Max's every move in the frame. This gag was of course picked up by others such as the Marx Brothers, but it's fluently pulled off here, with exquisite timing and very long takes that must have required a great deal of effort to achieve. There are a few items that may give offense to modern viewers; Linder frequently mistreats small dogs (dousing one here in a flowerpot; another in Be My Wife (below) is thrown out of a window. There are also some blackface gags as Linder masquerades as a porter. However, Linder doesn't stoop to racial stereotyping as other comics might have done; indeed, he forgets himself and starts trying to romance the woman that he was sitting next to in his own persona. Linder is funny enough that most viewers will pass over this politically incorrect moments. Tragically, Linder was unable to make a success of his American film career. Plagued by repeated illness, he returned to France and in 1925 killed himself in a suicide pact with his wife. Thankfully, Film Preservation Associates and David Shepard have helped keep his work alive with this release. One hopes that more of his French one-reelers will be forthcoming. Image Transfer Review: The feature is slightly windowboxed so that none of the frame is lost to overscan. The source print is a gorgeous original 35mm tinted print. Although worn and subject to scratches and flicker and a bit of spliciness, the detail and clarity are marvelous. The transfer is fine, without edge enhancement or ghosting. The intertitles are video-generated but acceptable. Little artifacting or visual problems are present. The extras for the most part look equally fine, though the Be My Wife extra (which seems to be from a laserdisc master) is slightly dupey and lacks the crystal clarity of the main feature. Audio Transfer Review: The music scores are compiled and directed by Robert Israel from period music, including popular favorites by Anton Rubenstein. The feature and one of the shorts are supported by a small orchestra, which sounds very nice most of the time, although the strings are on occasion a bit shrill. Hiss and noise are practically nonexistent, and there is plenty of surround information. The other shorts are accompanied by Robert Israel on the Fotoplayer, a combination player piano, organ, and sound effects machine from the period. Other than some excessive use of a slide whistle, these sound fine as well, though they have an intentionally cheesy character. Extras Review: Four one-reel films of Linder from earlier in his career are contained in the special features section (which thoughtfully includes a 'play all' button). Troubles of a Grass Widower (1912, 9m:50s) features Max getting left by his wife and his resultant pathetic efforts at housekeeping, which don't stop at doing the dishes with a garden hose. This short also appears in The Movies Begin set. Love's Surprises is an early Pathé that still has vestiges of the original hand-stenciled coloring visible. Max is here one of the three beaux of a stout matron, and he ends up stuck inside a grand piano. Max Takes a Picture (13m:08s) features Max at the seashore with a chunky bathing beauty; when she slips out of Max's sight while in the water, Max fears the worst and creates a ruckus trying to rescue a woman who's in no danger at all. Max Sets the Style finds Max getting dressed to a fancy affair, but while warming his feet manages to set his shoes on fire. Necessity is the mother of invention as he desperately tries to find a footwear substitute and ends up setting a fashion. Also included is an abridgement (13m:20s) of another 1921 American-made feature, Be My Wife. As the title implies, it involves the attempts of Linder to woo his sweatheart despite the interference of her Aunt Agatha, who acts as gatekeeper and is bound not to let Max through the gate. He develops a number of contrivances that have varying degrees of success, but the highlight of the film is Linder's gambit to pretend that there is a burglar in the house and then noisily combat said "burglar." I don't see how this could possibly have sustained a feature film, but in short two-reel form it moves briskly and coherently. This abridgement also appears in Slapstick Encyclopedia. The final clip (2m:41s) is more an historical oddity than anything, featuring Linder and famed director Maurice Tourneur in a comic boxing match with a third man. The quantity of extras is generous, but it's too bad that there's signficant duplication with other sets from Film Preservation Associates. A Max Linder feature and a number of shorts help bring an unjustly forgotten comedian back to the public attention, with beautiful prints and excellent scores. Recommended.